Amesbury Abbey occupies a unique position in the Stonehenge landscape. It sits on an eastern bank of the River Avon, west of Amesbury, east of the Stonehenge monument and in the lee of Vespasian’s Camp. According to British History online, the recorded history of the Abbey can be traced back to 979AD, some 1,035 years ago. Perhaps in exploring its past and association with the cult of St. Melor, echos from an earlier time — and of our ancestors, who built Stonehenge a little under two miles to the west — may reside. Facts surrounding St. Melor are, of course, elusive. The linked story above of St. Melor, which include a magical silver hand, a severed head that speaks, and untamed bulls, is typical of the folklore of Britain and its neighbouring Islands. Gwyn ap Nudd, son of Nudd of the Silver Hand, has been discussed at length here on Eternal Idol. Another example of a nuance of the silver hand story is also witnessed in the Slavic myth of Panagia Tricherousa, and there are many others. With a prevailing and often persistent southwesterly wind, it seems only natural that since man’s first exposure to the often harsh climate of Salisbury Plain he sought sanctuary from the elements and from the wind particularly, in the lee of the large natural spur of chalk we know today as Vespasian’s Camp. There is also a fresh water source close by at Blick Mead, which certainly today is the nearest source of fresh drinking water to Stonehenge itself. Amesbury Abbey sits centrally in the region recently named ‘The Cradle of Stonehenge’, which brings me to the subject of this post: the above photograph I captured in September 2013 of a floor tile from the original Abbey. During the dissolution of the monasteries, ownership of the Abbey land and buildings was transferred to Edward Seymour, Earl of Hertford, on 16 February 1541. It seems that what was not subsequently flattened by gunpowder, such as the spire, was sold for its value as scrap building materials. What remained had certainly fallen into ‘great ruin and decay’ by 1560. There is mention of an ‘old’ stone stable of four rooms existing in the old Abbey buildings. It is not beyond the realm of possibility that some of the stone used in this and other of the original Abbey buildings may account for some of the missing stones that disappeared from Stonehenge in antiquity. Inigo Jones fascinatingly recorded that ‘a stone coffin containing a corpse richly apparelled’ was found built into a wall. Inigo Jones designed the mansion house that to this day stands on the footprint of an area of the original Abbey buildings. During building works between 1840 and 1860, tiled paving and other medieval remains were discovered. It has been suggested that the tiles formed part of the floor of the infirmary or chapterhouse of the original Abbey and the image above is of one of those tiles. During the 1200s, which were contemporary with the tile, the Abbey was at the peak of its influence and prosperity. It was visited regularly by King Henry III between 1223 and 1256. After the ascension of King Edward I, who visited the Abbey in 1275, his sixth daughter Mary entered the convent in 1285 at the age of seven, in a ceremony witnessed byher father and the whole royal family at Amesbury Abbey. Eleanor of Provence was buried within the grounds of Amesbury Abbey in 1291 and her exact burial location is unknown at present. She remains the only former English queen without a marked grave. With royal aid, the buildings were enlarged and an infirmary chapel also built during this century. Similar tiles were manufactured by Cisterician monks around this time and were common on the floors of Medieval Abbeys in England. What is depicted on the tile ? A male lion’s head portrayed with a long and wild mane. The long mane particularly above the head area hints of rays emanating from the sun, stylistically similar to portrayals of the head of Belenus. A single oak leaf with two acorns attached emerges from each ear. A single oak leaf arises from each corner of the mouth. Is the lion’s tongue poking out ? Why would such a prestigious religious centre enjoying the patronage and the purse of kings of England choose the design of a lion’s head, possibly with its tongue poking out (which does seem to disarm the beast), surrounded by oak leaves and acorns as an image for a floor tile? Wouldn’t sober, pious Christian iconography have been more in keeping with the will of Rome? 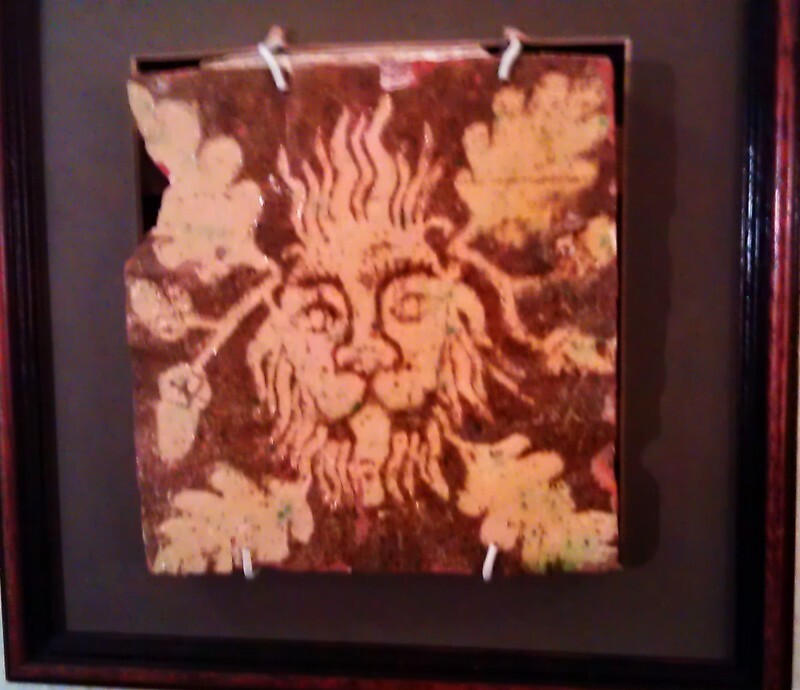 The lion’s head image appears to be in the style of the Green Man. Parallels have been drawn between the Green Man and the British Celtic deity Lud/Nodens. The apparent comfort with which the older Celtic imagery sat within the 12th century English establishment is a testament to the potency of an older, long-held belief system 12 centuries after the Roman invasion. The feline king of the jungle is a rare and mythical creature in Britain, a primeval and potent symbol, perhaps replacing the Ox, which was venerated in British prehistory. Gildas, writing in the 6th century, observed that the Romans referred to Boadicea as a ‘Lioness’. Both she and Richard the Lionheart are extraordinary individuals who earned such a rare and exalted status. Last September I viewed other medieval floor tiles beneath the carpet tiles in the visitor shop in Bangor Cathedral. A number of animals, creatures, and symbols are portrayed on these tiles, including, possibly, a lynx, which may not have become completely extinct in all of Britain until around the 7th century AD. The lynx has been linked with the Celtic solar deity Lugh here. I hope to return to this subject again in a later post with images. Unfortunately I only enjoyed a brief glimpse of these elusive floor tiles in Bangor Cathedral. One of the images appeared to be of a salmon resting on the back of the lynx, but I can not be certain. I can not end this post without touching on the subject of Geoffrey of Monmouth and his reference to ‘Mynyd Ambri’, the cloister at the mount of Ambrius and at least pose the question: Could this cloister have been at the location of Amesbury Abbey? He makes mention of ‘a lynx penetrating all things’ and of a king ‘crowned with a head of a lion’. I often wonder about the Britain that would exist today if the Synod of Whitby in 663/664AD had adopted Colman’s argument and followed Celtic Christian practices as opposed to a Roman-facing view. The original Amesbury Abbey priory might still be standing to this day and we might have known of the location of some of the missing stones of the Stonehenge monument. My heartfelt thanks to the Cornelius Reid family without whom this post would not have been possible . What emotion do you exude?